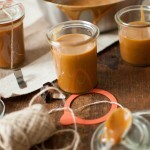 Traditionally, dulce de leche is made by simmering milk and sugar down for hours until you get a thickened, sweet caramel. I use condensed milk for my dulce de leche, which saves me at least an hour since the milk has already been cooked down. I should warn you that the first 15-20 minutes are the most critical time for this recipe. It is absolutely imperative that you free yourself of distractions. This is no time to answer the phone, switch out the laundry or put away the dishes. I can tell you from personal experience that cleaning sticky, burnt sugary-caramel from the nooks and crevices of your stovetop is a task that you’ll want to avoid at all cost, albeit tasty. Off the heat, place the condensed milk, vanilla seeds and sugar in a large saucepan. Pouring milk into a hot pan will scald and burn the milk on the bottom of the pan, so be sure to add the milk to a cold pan, off the heat. Turn the heat onto medium and stir the mixture until the sugar has dissolved, about 3-4 minutes. Once the sugar has dissolved add the baking soda and give the mixture one last stir. At this point, you don’t want to stir the pan, but rather swirl the pan. Stirring the pan can cause sugar crystals to form on the edge of the pan, which will make dulce de leche to be grainy instead of thick and creamy. You’ll also want to be careful that the mixture doesn’t boil over. It may be necessary to lift the pan from the burner while you adjust the temperature in order for the mixture not to boil over. Once the mixture beings to boil reduce the heat to a simmer and cook, uncovered for about 35- 45 minutes, until the mixture has thickened and is a deep-caramel brown. The dulce de leche will thicken up quite a bit as it cools. The longer it cooks the thicker it will be once it cools. 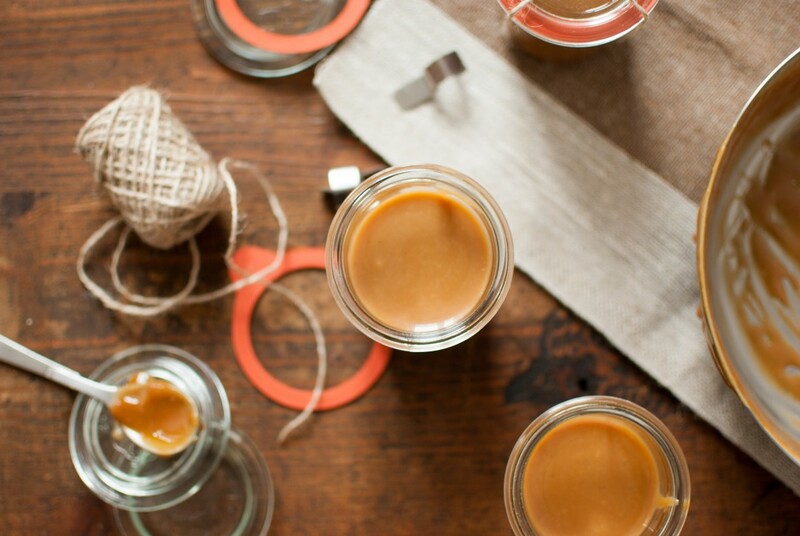 Once the dulce de leche is done, it can be used immediately or be stored in an airtight container for up to a month in the fridge. The first 15 -20 minutes are the most crucial for this recipe.